The horse is a large animal that needs a lot of exercise to help keep it fit physically. Attention to their physical well-being also keeps it fit mentally and emotionally. Horses that live on large acreage will move all day long; the smaller the acreage, the less room they have to freely move and the less fit they become. Most of us today are lucky to have our horses with us in our living situation, which often is on small acreage. We then become responsible for making sure that our horses stay fit and sane through frequent, regular, and moderate weekly exercise. Since making a lifestyle change a year ago from a large acreage property and a home-based business to a one acre rental property and working for someone else, my horses have gone from being worked at least three days a week to me grabbing the occasional early AM workout to only working out on the weekend. Just like humans, when you force that kind of exercise schedule on your horse, the risk of injury is higher, and the older the horse the higher the risk. 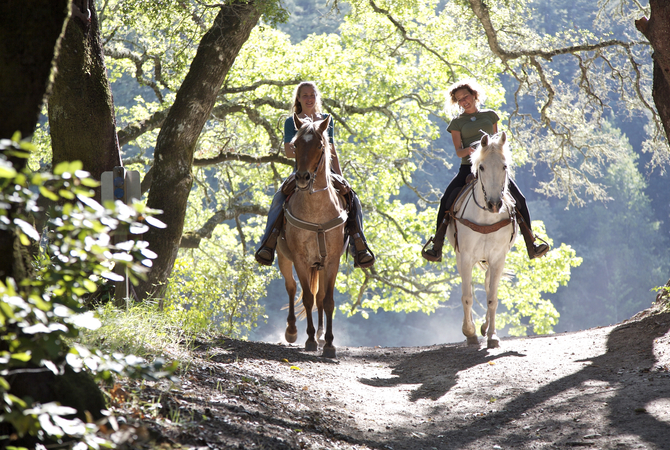 Just as 15-30 minutes of exercise a day has long-term benefits to you the rider, the same applies to your horse. Because of the changes in my own life and schedule, I recently needed to make a commitment to working out Nan on a more regular basis to help avert “weekend warrior soreness syndrome” and to improve Nan's frame of mind. After NOT exercising Nan during the week and only going out on weekend rides, I found that instead of a willing and nice companion, Nan was unwilling and more prone to general spookiness and "bad" behavior. Nan is also a cold-backed horse; she does not do well being ignored for a week and then being saddled and ridden only on the weekend. I did some research and devised a training schedule that works for me (time-wise) and for her physically. I started this routine the week that we had the time difference occur. I rose about an hour earlier and arranged my schedule so that Monday, Wednesday, and Friday I am out in the paddock working Nan in hand, in the round pen, and under saddle. Because I know Nan so well, I devised our routine so that I start with engaging Nan’s mind and it allows me to warm and gently stretch her muscles. Before I begin my ground work, I spend about five or so minutes with her in the round pen just walking her in alternate directions. This allows her to relax, get her mind on the “job”, and warm her muscles up. Then I bring her into the center of the round pen and I ask for deep neck flexes by using treats. Think hugging me with the neck. She is at a point now where I can willingly get her to flex and touch her sides with her nose. I have also taught her to bow, which helps to keep me established as her leader AND flexes her back and legs. I then stand in front of her and lift each leg and carefully stretch it out towards me. I do this three to four times until I feel her willingly give with no resistance. I then move to her side and gently poke her belly muscles until I feel her “draw” up (and you do actually see them arch their back). This flexes her abdominal muscles and strengthens her back. I generally do this five to six times, as it takes once or twice moving up and down her belly to get her to round up. I then move to her tail and GENTLY take her tail in my hands and lean back until I feel resistance, count to 10, and then SLOWLY and GENTLY come back to upright position. I cannot emphasize enough here - DO NOT SNAP BACK UP! DO NOT SNAP BACK UP! You can really injure a horse's back if you do not move slowly and gently. This exercise strengthens and helps to flex the long back muscles. My horse chiropractor showed me how to do both the belly exercise and the tail exercise. I then send her back out to the edges of the round pen and we work on trot/walk/trot/canter transitions for about 15-20 minutes. I bring her back in, slip her rope halter/lead combo (I do not believe in the separate halter/lead combos for working time) and we work on giving and moving exercises. I use Clinton Anderson’s techniques as this is what works for Nan and me. I encourage you to watch all of the clinicians out there, try them all, and then use whichever exercises feel comfortable to you and WORK for you and your horse. I then saddle Nan up and we are able to use a neighbor’s pasture next door to work. I start again with walk work in either direction on a loose rein. After a couple of times each direction (it is a 10 acre pasture), I then gather her and ask for her to “hold her head” again, not harshly, but using the bending and flexing side-to-side exercises. Bending at the poll, not the neck, we practice stopping and backing up several steps until I feel she is supple and responsive and not resistant. Then I work on trot (slow and fast) and some canter work. The idea for me is that I want her warmed up, not hot. I am looking for her mind to stay engaged, as well as her staying as physically fit as I can. Because of my life changes, I have had to alter what I wanted to accomplish in my ride time. I firmly believe that you have to ride the horse you have and that means you are honest about assessing their personality. Nan is so competitive in a large group that I have a hard time keeping her relaxed. I have come to the conclusion that she is just not a NATRC-minded horse and it was just not fun to fight with her when I got on her back and our riding partnership was suffering as a result. When I got honest about what we both really enjoyed, I realized that we (and yes, Nan does love being on trail) just love to trail ride in lots of different places. I love the horse camping, I enjoy the Nan and I time, and I enjoy riding with a small group of friends. The change in my current living situation also meant that I needed to reassess weekend competitions. I chose to participate in the shorter distance Texas Trail Challenges as Nan is definitely not in shape for endurance or long, fast mileage. I do ride her both Saturday and Sunday and we go distance, but we do long and slow distance with intermittent intervals of trot and canter work. As Nan ages, I have learned to make the adjustments needed for her physical and mental well-being. ...Heck, I have to make many of the same changes as I age. Change is a part of life and we should do it with grace and gratitude for the blessings we have. Not all of us get to live with our horses, but the adjustments we make to the living situations that we are in should always be about the care and welfare of your horse, as well as yourself…. Happy Trails! The North American Trail Ride Conference (NATRC) is an organization that sanctions competitive trail riding events. In these events, judges evaluate both horse and rider for condition, soundness, trail manners, horsemanship, trail safety and courtesy. This article also mentions active stretching as a preparation for mounted riding. Only experienced and trained horse owners should perform active stretching, as there is a potential to stress or strain and cause damage to your horse if not performed correctly. Passive stretching exercises can be used as an alternative for most horse owners.